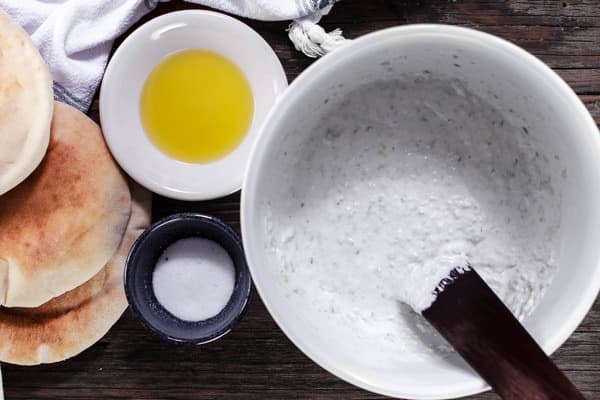 You’re in for a treat today; this authentic Greek Tzatziki sauce recipe comes to us from the Greek island of Paros! Tzatziki is a creamy Greek yogurt sauce with cucumbers and fresh garlic. This is a versatile sauce that is the perfect accompaniment to many Mediterranean dishes. You can also slather it on your sandwiches; or simply use it as a dip with warm pita and your favorite vegetables! This simple recipe comes together in 15 minutes. Be sure to watch the video below for how to make it! A few months back, my friend Cheryl Sternman Rule sent me a copy of her gorgeous book Yogurt Culture. And as the subtitle of the book states, Cheryl takes a detailed global look at how to make, bake, sip, and chill the world’s creamiest healthiest food! 300 pages worth of wonderful recipes utilizing yogurt with original stories weaved in between. And of course, one recipe that immediately jumped at me is the Greek Tzatziki sauce recipe! 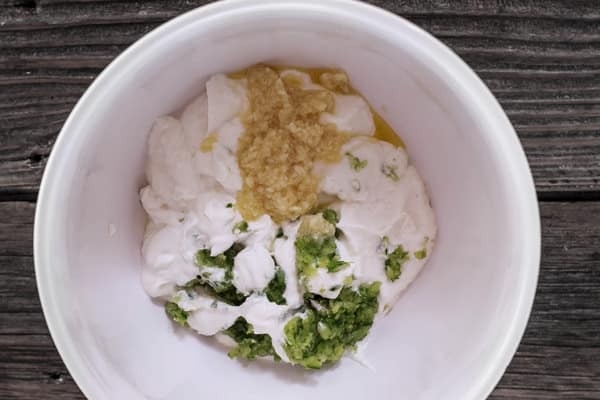 So the short story of this Tzatziki sauce recipe–it came from the Greek island of Paros, where Stella Leonetti serves it regularly in her restaurant called Rafeletti. As authentic as they come, but I’ve pared it down a bit to fit my small family’s needs. 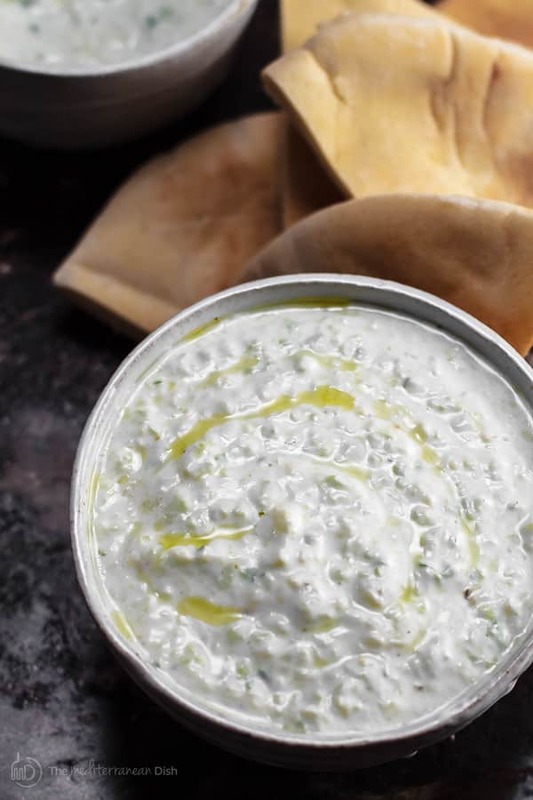 This is an intense and creamy tzatziki with three star ingredients: Greek yogurt, cucumber, and garlic. 1- To make tzatziki, start by grating the cucumber in your food processor with a pinch of kosher salt. I like to use English seedless cucumbers that have been at least partially peeled. 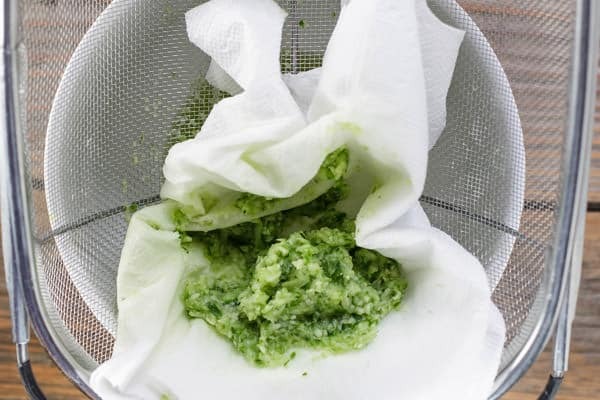 Make sure that you drain the cucumbers very well over a mesh sieve. You can do this step ahead of time, or if you’re in a rush, it’s helpful to place the grated cucumber in a clean kitchen cloth or a heavy napkin and squeeze all the liquid out. 2- I like to mix my actual tztaziki sauce by hand in a large bowl. First, combine the garlic with white vinegar, extra virgin olive oil, and a pinch more salt. Add the drained cucumber. Finally, stir in the strained yogurt (I use fat-free Greek yogurt, but the original recipe calls for full fat Greek yogurt.) Make sure to stir until everything is well combined. 3- For best taste and texture, cover tztaziki sauce tightly and refrigerate for a couple of hours before use. 4- If you’re not sure you can handle this much garlic, start with half the amount of garlic the first time you try it. Tzatziki sauce is versatile; there are so many ways to enjoy it. For an easy appetizer or snack, I love to serve Tzatziki with warm bread and sliced vegetables. But it makes a perfect topping for Mediterranean-style baked potato; or next to stuffed snapper or pan-seared trout; lamb chops; chicken souvlaki; shawarma and more! I also use it simply as a sandwich spread. You can make tzatziki sauce ahead of time. It’s best to store it in the fridge in a tightly-covered glass container. Use it within 2 to 4 days. 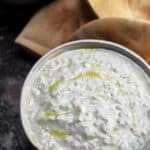 Creamy Greek Tztaziki Sauce. 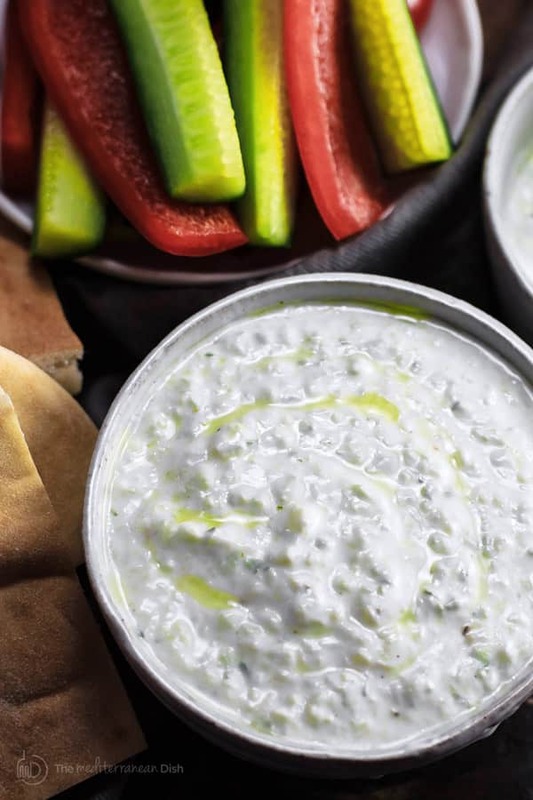 A versitle Greek yogurt and cucumber sauce to serve along with veggies and pita, spread on sandwiches, or add it next to grilled fish, meat or poultry! In one large mixing bowl, place the garlic with remaining 1/2 tsp salt, white vinegar, and extra virgin olive oil. Mix to combine. Combine and chill. Add the grated cucumber to the large bowl with the garlic mixture. Stir in the yogurt and white pepper. Combine thoroughly. Cover tightly and refrigerate for a couple of hours. When ready to serve, stir the tzatziki sauce to refresh and transfer to serving bowl, drizzle with more extra virgin olive oil, if you like. Add a side of warm pita bread and your favorite vegetables. (also see notes for more ideas) Enjoy! This recipe is adapted from Yogurt Culture. It is my quick version, and it’s been cut down to suit a smaller family. Cook’s Tips: This is very garlicy dip, if you prefer, start with a smaller amount of garlic and incorporate more as needed. And to change things up, feel free to stir in a tablespoon or so of chopped fresh dill or fresh mint. To Store: It’s best to store tzatziki in the fridge in a tightly-covered glass container, and use within 2 to 4 days. Suggestions for Use: Tzatziki makes the perfect topping for Mediterranean-style baked potato; or next to stuffed snapper or pan-seared trout; lamb chops; chicken souvlaki; shawarma and more! I also use it simply as a sandwich spread. Recommended for this Recipe: Early Harvest Greek extra virgin olive oil. SAVE! Try our Greek Olive Oil Bundle. « 25 Mediterranean Recipes for Your Cookout Menu! I live in Japan and miss Tzatziki so much. I would like to make this but the cucumbers here are much smaller. Would you have an estimate in grams as to how much cucumber you use? Thank you so much!